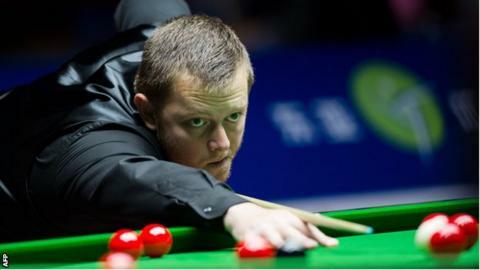 Antrim's Mark Allen progressed to the second round at the UK Championship in York as he defeated Scotland's Eden Sharav 6-2 on Thursday. The sixth seed reeled off six frames in a row with century breaks of 103 and 125 helping him recover from a 2-0 deficit to clinch victory. His victory sets up a meeting with Belgian Luca Brecel, who defeated Thailand's Noppon Saengkham 6-1. Joe Swail lost 6-4 on Thursday against England's Peter Lines. Lines will now face Ronnie O'Sullivan although the five-time world champion is a fitness doubt because of a broken ankle. O'Sullivan, 39, suffered the injury while running this week and he wore a protective brace in beating Daniel Wells 6-2 in the first round. "I didn't enjoy any of it. It's painful for me to play," said O'Sullivan. "I wanted to see what happened. I was hobbling about and I can't get on a shot properly. If it doesn't improve I am not sure I will play my next match." Allen has made two ranking finals this season, losing to Stuart Bingham in the Shanghai Masters and Ricky Walden in The International Championship. The Antrim player has now equalled his career best world ranking of six. Allen reached the semi-finals of the UK Championship in 2010 and went one better by reaching the 2011 final, which he lost to Judd Trump. The former world semi-finalist made it as far as the quarter-final stage in York last year and has won the World Open in China twice in recent years. Kent-based Northern Ireland international Gerard Greene began his campaign with a 6-2 win over Australia's Vinnie Calabrese on Wednesday.